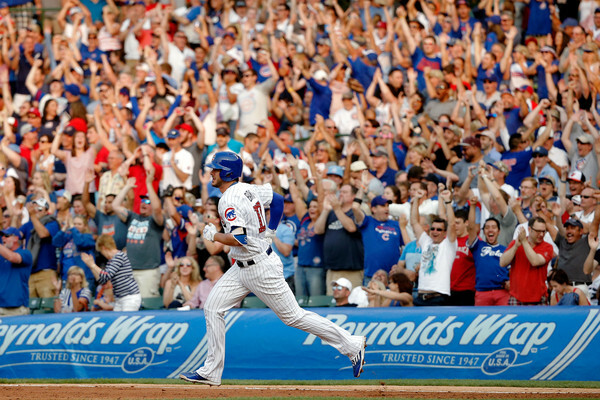 Kris Bryant hit two Independence Day home runs, including a grand slam. It was really a great day from start to finish for me. I got to spend time with my family, was able to see a few friends, I got to take in several different baseball games, and went to some fireworks with my mom, wife, and sister before she heads back to college. Baseball will announce the All Star starters tomorrow after the games are complete, with the rest of the rosters being filled out on Monday. ESPN experts let us know who they would pick in the American League and the National League. I watched all nine innings of the Nationals game – love the 11:00 AM start. The Nationals just look really good right now. They’re not even close to being healthy and they’re taking it to a scrappy team like the World Champion Giants with contributions from the likes of Michael Taylor, Tyler Moore, and Clint Robinson. These injuries they’ve faced have allowed them to build some depth and may end up making them a more formidable team if things break right in October. As I told my buddy Brent who was at the game in DC today, they’re definitely winning their division. Even with Strasburg going on the shelf again. I watched a lot of the Reds game before we went to the fireworks tonight. Man, the Reds are awful. I halfway though the Reds would put forth a nice effort tonight after getting pounded by the Brewers last night. Nope. Josh Smith is not a big league pitcher. I have seen all I need to see from the guy. He’s not ever going to be good. Todd Frazier had four more hits in the 7-3 losing effort. They’re talking firesale on the telecast. It’s really hard to watch this. I’m watching the Diamondbacks and Rockies game in Arizona now as the night winds down. Patrick Corbin making his return for the Dbacks. He kind of looks like the same old Corbin collecting outs and fending off a few glancing blows. I like Corbin. HUGE days from Cameron Maybin, Joe Mauer, and Kris Bryant pictured above. They didn’t take the holiday off. Matt Harvey seems pretty pedestrian right now. He gets the loss in Los Angeles to Zach Greinke and the Dodgers after putting the Mets in a 4-0 hole. JD Martinez hit home run number 22 off R.A. Dickey in the first inning today in Detroit. He’s morphed into a monster. Oakland hangs 10 hits on Felix Hernandez, and Kendall Graveman beats the Mariners 2-0 in Oakland. These are two weird teams you can’t begin to figure out. The Angels have 13 hits and 16 runs in Texas, and Mike Trout is hitless. All in all another great Fourth of July in my life. It’s kind of weird because from here, the summer starts to melt away as we head towards fall. The season is pretty much officially half over. That’s sad to me in a way.